Hazen acquires a website he’s wanted for a long time. 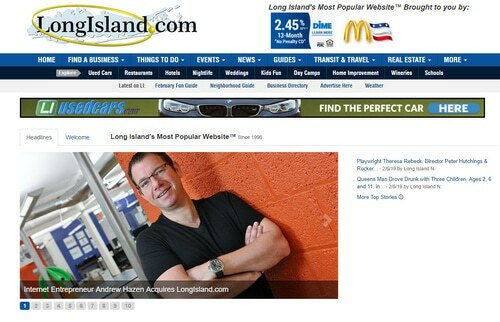 Domain investor, website developer, and bobblehead seller Andrew Hazen has purchased the website LongIsland.com. According to a story on LongIsland.com, Hazen tried the buy the website (a directory at the time) in an auction a decade ago. His $250,000 bid wasn’t enough; the site sold for $370,000. The buyer continued to build out the site and grow its traffic. Hazen met with the owner recently and mentioned he was still interested in owning the site. That turned into a deal that closed last month. Hazen’s other businesses include running co-working locations LaunchPad Long Island and bobblehead business BobbleBoss.com. I have reached out to Hazen for more details.